The MaRS Center is seeing the second phase of development go on hold. Phase II, which involved the development of a second tower on the west side of the property, has been cancelled, despite having been ahead of schedule so far. The reason given by Alexandria Real Estate Equities Inc, the American developer behind the project, is that they just couldn’t secure enough leases to make the project move forward. I first heard about this a few days ago when an unsubstantiated rumor was posted on Urban Toronto (a great forum that I lurk in). Then when I was up in the area yesterday I noticed that the site was pretty quiet, but still wasn’t sure. That was until I looked at the National Post this morning and it was right there on the front page. The MaRS center is a confusing thing for tech entrepreneurs. There are a few startups in there, and it is home to a Celtic House office and RBC Ventures. They also have some really fantastic people working there, such as Peter Evans and Allen Gelberg, who have reached out to the startup community in a big way and who have provided a venue for things like Mesh and the Facbook Developer Garage. 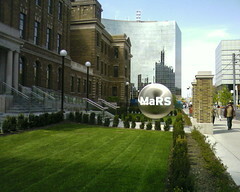 My sense is that MaRS has a much bigger impact on the medical research and commercialization community, but I am not connected to that community and have no way of knowing. MaRS was never a center for the tech community however. Simple economics make it impossible for such a high-cost building to truly have an impact at a community level. There are three old garment factories at Spadian and Queen that have had more of an impact. This isn’t a new phenomenon either, when I was building some of my first startups in Charlottetown, the provincial and federal government spent almost $35million building something called the Atlantic Technology Center. In terms of the size of the city and community, the Atlantic Technology Center was even more ambitious than MaRS, and it was even more disconnected from the community. While some of the best startups were moving in to great historic office spaces, government contractors and service firms piled in to the Tech Center. It was high-cost, anti-septic and too ambitious. The truth is, if you want to transform the tech community in a place like Toronto or any other city, you don’t need $20million, or $200million. For all the dreams of trying to turn some city in to the “next valley”, the point gets missed every time. You could put Toronto, Montreal, Halifax, Calgary or Vancouver on the world map with almost no money. Put a couple million together and find the right people to deploy it. We need to start loving our cities and the communities that are coming to life in them. The problem is that government officials can ascribe value to real estate. We all love to build big things that people can see, touch and talk about. Until those same people can understand the value of a vibrant and productive community, then we will never get the participation that we truly need. It is worth pointing out that MaRS has billed itself as a home for academic research and eventual commercialization, not simply a home for the tech community. I believe that the same fundamental principals are in play however, and that the task of building a commercialization engine in this city is not a real estate problem, but a social one. I don’t know what this means for MaRS and their efforts in the community, but I hope it is a chance for them to step back and refocus. They have a great team that I believe will still do great things. I would hope it has as this is the main purpose for the center. True though, I didn't see any work done yesterday. True though, I didn’t see any work done yesterday. Accelerators that are real estate with added services don’t work. They can’t work. Why as a cost conscious entrepreneur would I choose your space for rent + fluff, when I can pick the space 3 doors over for less rent and choose the services and providers that make sense for me. So I pay less for rent, I get to choose best-of-breed providers, and I'm not beholden on my cap table to any equity or debt to my landlord. Seems like entrepreneurs might want to avoid accelerators. We saw this in the late 90s with CMGI and Divine Interventures among others. Unless there is significant operational efficiencies to collocating or co-operating, it is just a waste of time. The focus on community is new. It is different. It is about promoting the connections between people. Those with money. Those with ideas. Those looking for jobs. It is the community that supports early-stage deal flow and venture creation. It is not about moving call centres to Toronto or Waterloo, it is about encouraging entrepreneurs and connecting would-be-entrepreneurs with people, money, talent and opportunity. When you look at the efforts at YCombinator and TechStars, it's about the education and connections. Not about being in the same space. Geographical proximity is not based on floor space, it's based on commuting distance. I think the only example of an accelerator working is the Centre for Social Innovation http://socialinnovation.ca/ at 215 Spadina Ave. And they work because Tonya Surman has realized that CSI is about community. It's about the connections between the companies, contractors and people in the space. They work tirelessly to vette people before letting them in the space. They need to have shared values and goals and operating principles. It's the only way it can work. The problem with spaces like MaRS is that there is no buzz. They are antesepic. They don't allow entrepreneurs to build social capital, and they don't let mentors spread their social capital. They are a great group of individuals – Ilse, Peter, Allen, Cathy and the entire MaRS staff. And the content provided by programs is fantastic. The challenge is that MaRS is only a hub for it's tenants. Accelerators that are real estate with added services don’t work. They can’t work. Why as a cost conscious entrepreneur would I choose your space for rent + fluff, when I can pick the space 3 doors over for less rent and choose the services and providers that make sense for me. So I pay less for rent, I get to choose best-of-breed providers, and I’m not beholden on my cap table to any equity or debt to my landlord. Seems like entrepreneurs might want to avoid accelerators. The focus on community is new. It is different. It is about promoting the connections between people. Those with money. Those with ideas. Those looking for jobs. It is the community that supports early-stage deal flow and venture creation. It is not about moving call centres to Toronto or Waterloo, it is about encouraging entrepreneurs and connecting would-be-entrepreneurs with people, money, talent and opportunity. When you look at the efforts at YCombinator and TechStars, it’s about the education and connections. Not about being in the same space. Geographical proximity is not based on floor space, it’s based on commuting distance. I think the only example of an accelerator working is the Centre for Social Innovation http://socialinnovation.ca/ at 215 Spadina Ave. And they work because Tonya Surman has realized that CSI is about community. It’s about the connections between the companies, contractors and people in the space. They work tirelessly to vette people before letting them in the space. They need to have shared values and goals and operating principles. It’s the only way it can work. The problem with spaces like MaRS is that there is no buzz. They are antesepic. They don’t allow entrepreneurs to build social capital, and they don’t let mentors spread their social capital. They are a great group of individuals – Ilse, Peter, Allen, Cathy and the entire MaRS staff. And the content provided by programs is fantastic. The challenge is that MaRS is only a hub for it’s tenants. I think that this was the main intention of the facility. If they were looking to build an accelerator then they wouldn't have leased the top four floors of the tower to sick kids research before it even opened. yes, there is an incubator in the building but lets compare how much space they use compared to sick kids, UHN and all the parma companies to have satellite offices there. Labeling MaRS an accelerator/incubator in my opinion is not correct. CSI is indeed a good accelerator model since it is focused on community building where as MaRS is focused on corporate leases. I think that this was the main intention of the facility. If they were looking to build an accelerator then they wouldn’t have leased the top four floors of the tower to sick kids research before it even opened. I've gotten a lot of value out of MaRS because it's not tech focussed. Other sectors simply don't collaborate and organise as well as those of you in web/tech. Bio tech, Green tech, Social Entrepreneurship, Impact Investing, BCorps, represent a pretty wide mandate for MaRS, and some pretty traditional business models. Sometimes they get it right, sometimes frustratingly wrong but they are trying to serve the greater community. Could MaRS improve? Absolutely yes. I see many areas they miss out on because I touch tech, green, product manufacturing, social enterprise, etc. But I respectfully disagree with your suggestion that they should “refocus”. Defining a wider mandate serves everyone not just a vocal minority. I’ve gotten a lot of value out of [email protected] because it’s not tech focussed. Other sectors simply don’t collaborate and organise as well as those of you in web/tech. Bio tech, Green tech, Social Entrepreneurship, Impact Investing, BCorps, represent a pretty wide mandate for MaRS, and some pretty traditional business models. Sometimes they get it right, sometimes frustratingly wrong but they are trying to serve the greater community.